Going well beyond basic audio and video capture, the Nanit baby monitor and baby camera has a true grasp on the word "smart". From a number of angles. Baby monitors have been around since the 1930’s but there hasn’t been much innovation in the space for a while. For years baby monitors were glorified intercoms that enabled parents to listen (and eventually of course watch) for crying and concerning events throughout the night. Many devices in the space have been plagued with poor quality feeds and both interference and security issues where neighbors and other unauthorized parties could tune in. They have also largely lacked an intelligence layer that provides holistic analysis, simple assimilation, and enhanced interaction. 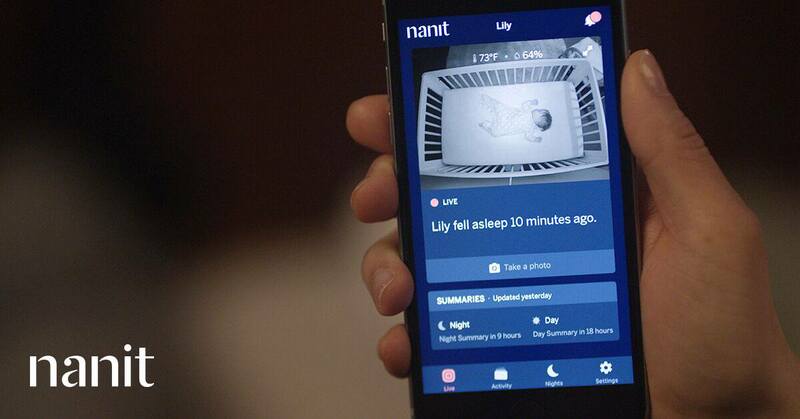 Nanit is hoping to help the baby monitor market do a bit of growing up. 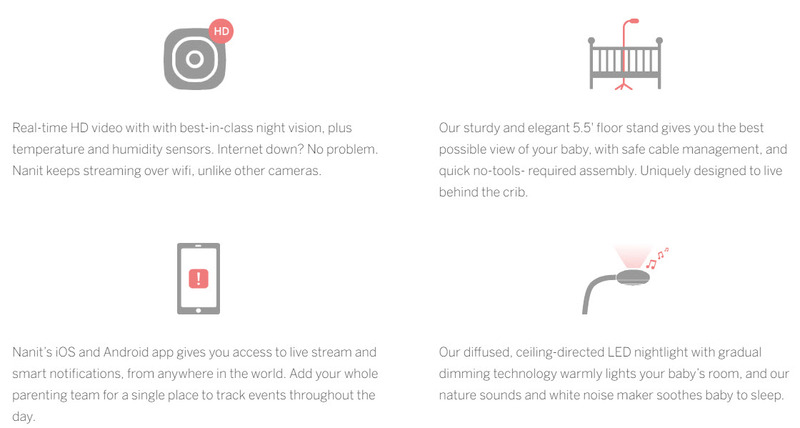 Nanit is a smart baby monitor and camera that, at its base, delivers HD quality video to a parent or caretaker’s phone or tablet through a companion application. From there, the “intelligence” kicks in. 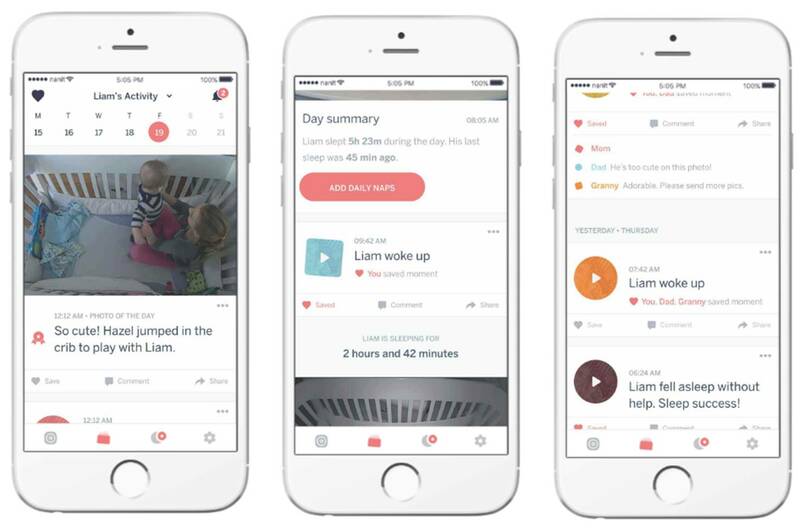 Nanit offers sleep insights and rollup features, allowing parents to track their child’s sleep activity throughout each night (it knows when the child has fallen asleep or woken up). The information is stored in the companion app and summarized in order to measure the child’s sleeping patterns over the course of longer durations. It then compares those patterns to healthy averages. The camera also monitors the room temperature and humidity so parents have a holistic view of the child’s environment. The unit can even be used as an audio speaker to play white noise or a selection of nature sounds. The software also generates a heatmap that provides a visual overview of how much a child moves throughout the night and exactly to which areas of their crib / bed they move. The camera feed allows HD images to be captured and recorded whenever parents want. There are also social media / messaging components to the companion app; recordings and images can be shared with friends and family, digital scrapbooks can also be created and people provided authorization make posts and communicate through the application. As with many smart devices, security and privacy are two major concerns the developers of Nanit had to address before bringing their product to market. To address the relevant requirements, they take a three-pronged approach to digital security. The first prong is that their servers are HIPAA compliant meaning Nanit holds themselves to the same standards as hospitals and doctors. The second prong is that all data and communications are encrypted using AES 256-bit symmetric key encryption. Finally, rather than building cameras which use an IP address that can be hacked, the third prong is restricted communication lines; Nanit streams all video information to only company servers and authorized devices. In addition to the focus on digital security, the creators of Nanit also put a significant emphasis on physical safety of the units. The main safeguards include wrapped cables out of the child’s reach, a tip-proof stand, a shatter resistant lens, and best-in-class radiation shielding. The company also offers a Multi-Stand offering better portability during travel and a better wide-angle view of the home nursery. The Nanit smart baby monitor system is currently available for pre-order starting at $279 and has an estimated retail price of $349. The entry level Nanit supports notifications and live video streaming, while the higher end versions (currently $329 and $459) support rolling video recording, multiple users, and collaboration tools. The estimated ship date is currently September 2016. To date the company has raised a $6.6M in seed funding. Being able to keep an eye on your baby is key to keeping the stress of having a newborn in the house. It is sad, but this being smarter than most parents is definitely not far from the truth. The fact that HIPPA is even mentioned sort of gives me a warm fuzzy feeling about the security of the system, which is nice. That would be my number 1 for the price that you have them listed at! Very cool. New parents want to know more and keep a close eye on the baby. There is NOTHING wrong with that and for the $350, I would struggle to find a better, lower priced option. Very nice. As a new parent myself and a bit of a stat nerd, I like all of the things that the apps can tell you. Looks like a great product and one that has a good price as well!